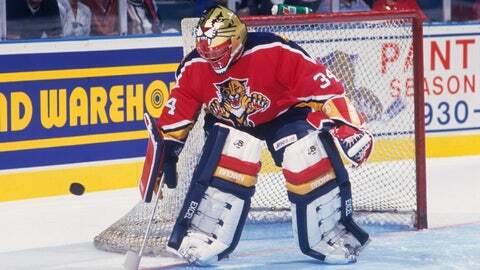 SUNRISE, Fla. — When John Vanbiesbrouck joined the Florida Panthers, he sought personal solace. In doing so, he unexpectedly strengthened the roots of an NHL franchise. Hardly gone unnoticed by the Florida Panthers, the team welcome back the former netminder as part of their 20th anniversary celebration. There were reunions with former teammates. Bobbleheads scooped up by long-time and new fans. Autographs to be signed. A ceremonial puck drop with No. 34 at center ice and chants of “Bee-zer” from stands above. Little seemed to be going right for John Vanbiesbrouck in April 1993. The New York Rangers, a first-place team a season earlier, were mired in a downward spiral that would see them lose 13 of their last 16 games. Vanbiesbrouck’s playing time slowly shifted to a younger goaltender, Mike Richter. In a start on April 4, Vanbiesbrouck rebounded from a pair of losses with a 28-save shutout over the Washington Capitals. The good performance and a win brought a familiar smile back to the Detroit native. The next game, Vanbiesbrouck found himself in the loss column once again. At the time, he did not realize it would be the last appearance in his 10-year career with the Rangers. Two days later his mother called. Frank, his older brother and goaltending mentor, had committed suicide. Even the offseason, time away from the rink offered the veteran little opportunity regain normalcy and stability. In June, the NHL introduced two new teams: the Mighty Ducks of Anaheim and the Florida Panthers. By the end of the month, the teams would be drafting scraps from NHL teams to fill their rosters. The Rangers, not wanting to lose Richter in the expansion draft, sent Vanbiesbrouck to the Vancouver Canucks for future considerations. But Vancouver had no intention of keeping Vanbiesbrouck. They merely wanted a buffer for starter Kirk McLean. A coin flip changed many fates on June 24. Florida earned the right to select first overall in the expansion draft, and then-general manager chose Vanbiesbrouck as the foundation of his new franchise. The memories of those early days are fuzzy for Vanbiesbrouck. He recalls attending the jersey unveiling in New York, the and mall tours in South Florida to generate interest for ice hockey in the area. But the questions and curiousity soon gave way to routine. A group of players with little in common — other than being rejected by clubs that left them dangling — started to come together. “If you had to capture it, we were a good bunch of characters,” Vanbiesbrouck said. “I think we overachieved, which is always nice. During the five years Vanbiesbrouck spent in Florida, he served as the face of the franchise. On the ice, his numbers hovered among the league’s best. He posted three 20-win seasons in Florida, including back-to-back 25-win seasons in 1995-96 and 1996-97. Vanbiesbrouck represented Florida at three All-Star Games. Following the Panthers inaugural season, he finished as a finalist for the Hart and Vezina trophies. During Florida’s glory years, Vanbiesbrouck etched his DNA in the team’s culture. It may have been Scott Mellanby who killed a rodent in the Panthers locker room, but it was Vanbiesbrouck who dubbed the winger’s action hockey’s first “Rat Trick,” when the winger scored two goals after playing exterminator. “He’s was cold killer,” Vanbiesbrouck said of Mellanby. The goaltender’s comment, of course, led to the Year of the Rat in 1996, with fans buying rubber rodents by the thousands to throw on ice at Panthers games. Yet it came as a surprise to Vanbiesbrouck, 17 years later, to witness Panthers fans continuing the tradition by tossing vermin after victories. The Year of the Rat may have saved the Panthers. Without the Florida capturing the hearts of fans during the 1995-96 season and the eventual Stanley Cup run, Vanbiesbrouck might not even be honored here. With then-owner H. Wayne Huizenga threatening to move the team elsewhere without a new arena, South Florida clamored to keep the franchise it was quickly falling in love with. By the time financing and a Sunrise location had been secured for the Panthers’ future home in February 1996, things started taking off on ice. Florida, in large part of Vanbiesbrouck’s on-ice heroics, advanced to the Stanley Cup Finals. Jovanovski offers a different perspective. The whirlwind of marching through the postseason came to a sudden halt in the early morning of June 11. The longest game in Panthers history came to an end. Hall of Fame goaltender Patrick Roy had stopped all 63 shots faced. Vanbiesbrouck stopped 55 of 56. The Colorado Avalanche captured the Stanley Cup with a sweep of the Panthers. The memory of that year, postseason, series and game remain with Vanbiesbrouck. It sticks because it was a moment shared. “You like to think you have a lot of have a lot of highlights [in your career], but that was specifically one that captured the hearts of a lot of people, not just myself,” Vanbiesbrouck said. “I think when you capture the hearts of fans like that, create the whole rat thing, the niche, it communicates to fans. These days, Vanbiesbrouck serves as the general manager for the United States Hockey League’s Muskegon Lumberjacks, a Tier I junior hockey club in Michigan. Although a few NHL prospects have been drafted from the league, it predominently serves as an opportunity for players to develop for the college level. The Lumberjacks have 10 players on their current roster committed to play college hockey. The organization as a whole has produced 46 collegiate players. Vanbiesbrouck smiles when talking about the task of mentoring young players.